Summary from Goodreads: Twelve-year-old Mosca Mye hasn't got much. Her cruel uncle keeps her locked up in his mill, and her only friend is her pet goose, Saracen, who'll bite anything that crosses his path. But she does have one small, rare thing: the ability to read. She doesn't know it yet, but in a world where books are dangerous things, this gift will change her life. Enter Eponymous Clent, a smooth-talking con man who seems to love words nearly as much as Mosca herself. Soon Mosca and Clent are living a life of deceit and danger -- discovering secret societies, following shady characters onto floating coffeehouses, and entangling themselves with crazed dukes and double-crossing racketeers. 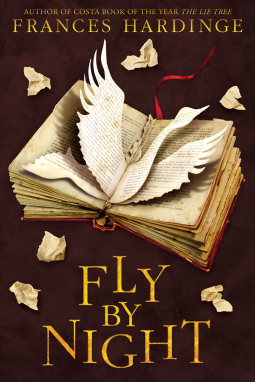 It would be exactly the kind of tale Mosca has always longed to take part in, until she learns that her one true love -- words -- may be the death of her. Review: To tell the truth, I wasn't expecting how this story went, but it was a good surprise. We follow Mosca Mye as she tries to escape her dreary life by hooking up with Eponymous Clent. Clent tries to ditch Mosca at every turn, but the girl is resourceful and learns a secret bout Clent that makes her valuable. With this information, Mosca falls in with several dangerous groups, all who want to take out the other. And just when you think you know who is right and who is wrong, Ms. Hardinge throws you a curve. I was sucked into this old English world where no one can be trusted and everyone has a secret. Serasin the Goose has to be my favorite character, but Mosca came in a close second. I would recommend this book to anyone who likes a good adventure or mystery. Four stars for Frances Hardinge.